Despite lack of encouragement for a successful outcome, the customer asked us to please make an attempt to clean the rug. The next picture shows the result of our service's basic rug wash. No heroics were performed, but the rug looks as good as new. 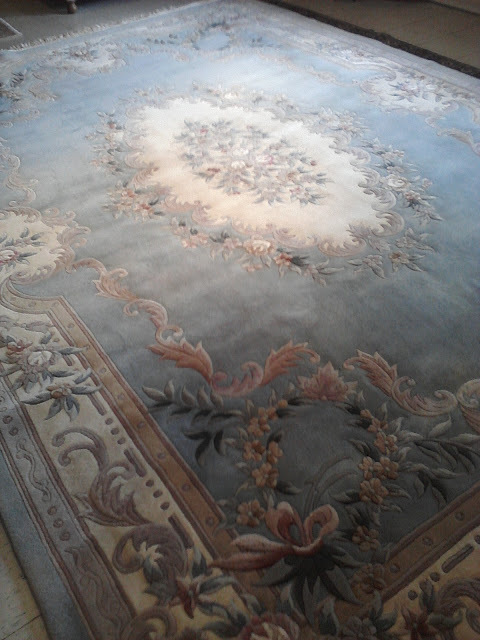 We can't promise miracles in every instance - because we don't always know what has happened to a rug over time - but there is almost always appreciable improvement in appearance when you elect to have an oriental rug professionally cleaned by a complete, properly qualified service such as that offered through Brandon Oriental Rugs. 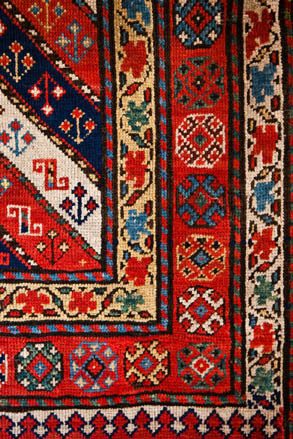 The problems from dirt, stains, and other environmental exposures if not eliminated entirely can be minimized to some degree to also restore your enjoyment of your treasured oriental rug. 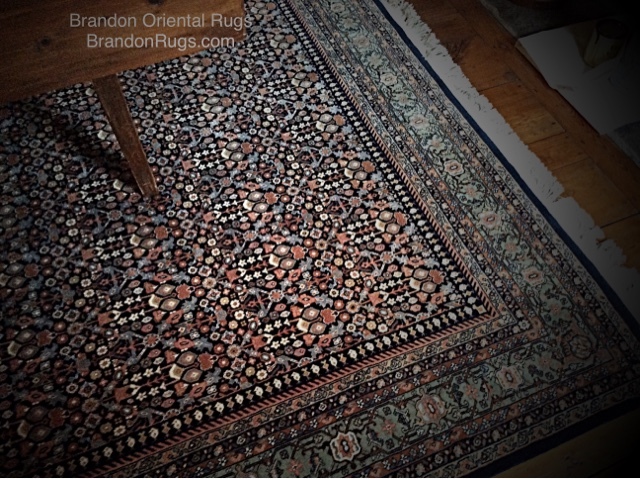 Brandon Oriental Rugs also offers professional rug repair and certified rug appraisal services for the complete protection of your rug and your investment in it. 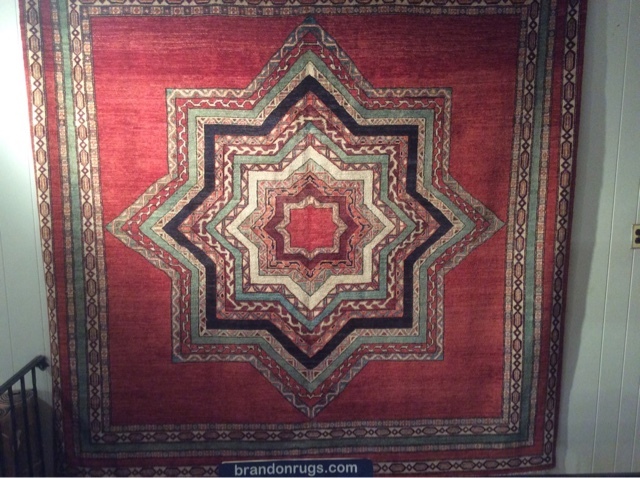 Call us (215-794-2300) to discuss how your rug(s) can benefit from all the services Brandon offers. Brandon Oriental Rugs - www.BrandonRugs.com - the company of oriental rug sales, cleaning, and repair in Bucks County, PA.
WSJ: "From Rugs to Riches" article shows that as "works of art worthy to be in works of art", fine oriental rugs have significance beyond just being something to put on the floor. 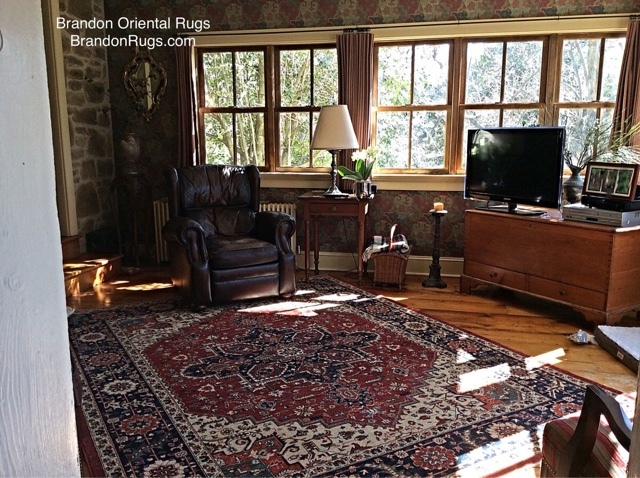 Homeowners entrusted with stewardship of an historic Bucks County farmhouse located in Doylestown, PA recently selected a traditional handmade oriental rug from Brandon Oriental Rugs - www.BrandonRugs.com - to appropriately complete the "sunroom" of their lovely home. 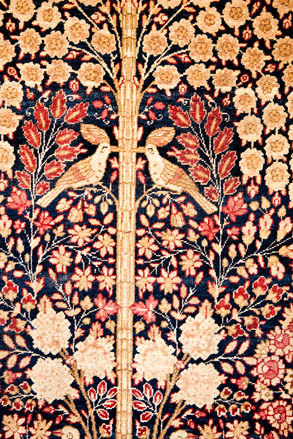 An 8x10 antique reproduction, hand-knotted, Persian Heriz design oriental rug made in India with vegetal dyes and hand-spun wool yarns was selected by the Doylestown homeowners to complete the newly furnished and re-purposed room, blessed with year-round morning sun, at the rear entrance to their centuries old home. 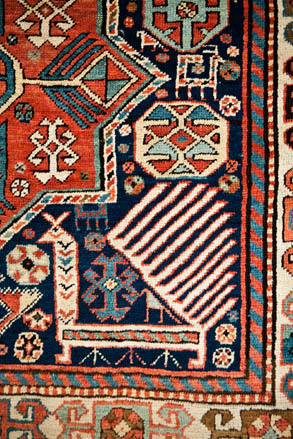 The vintage look of the Heriz rug is period and style appropriate for the age and character of the home. 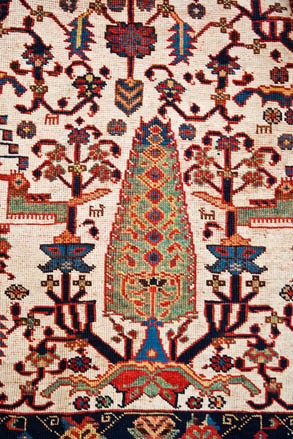 Notice the characteristic "double-outlining technique" found in many rug styles, particularly Heriz types, originating in northwest Iran. 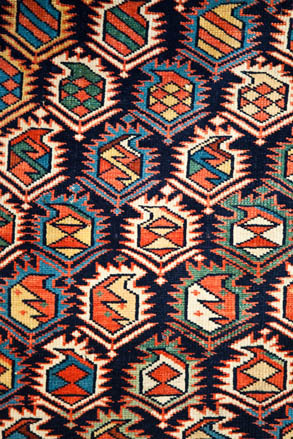 This technique provides enhanced contrast and definition to transitions between major design features (primary border and flanking guard stripes; inner guard stripe and rug background or field; field and medallion.) 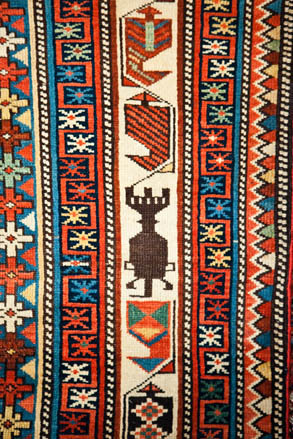 WIthout this technique these often coarsely woven rugs would not have the same bold, vivid character. 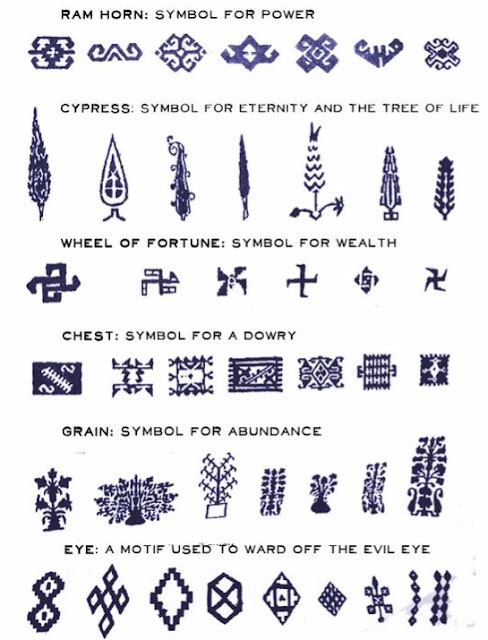 Instead they would have the less defined, or soft and diffuse, appearance of the not so distantly related Turkish Oushak style rug. 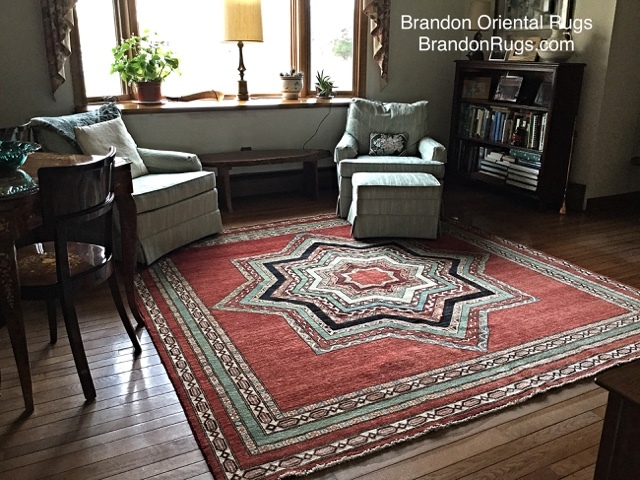 A New Hope, PA customer of Bucks County rug store Brandon Oriental Rugs - www.BrandonRugs.com - selected this 8x8 square, one-of-a-kind, hand-knotted Pak-Kazak oriental rug to bring eclectic flair to the "formal" living room of her custom built home. 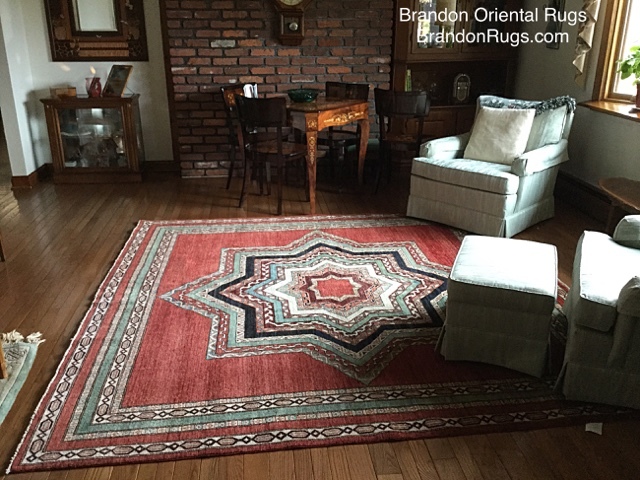 Brandon Oriental Rugs provided our customer with complimentary rug delivery to her New Hope home. Installation of her rug together with the proper rug padding was also included so that she had nothing to do except enjoy the rug presentation and decide if her first impressions of the rug at Brandon's store were confirmed by its look and feel in her home. 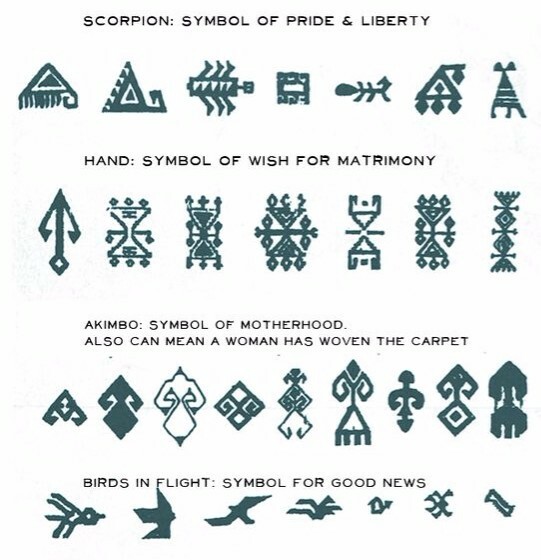 The design is a modern interpretation of the traditional Caucasian "Star Kazak" design style. 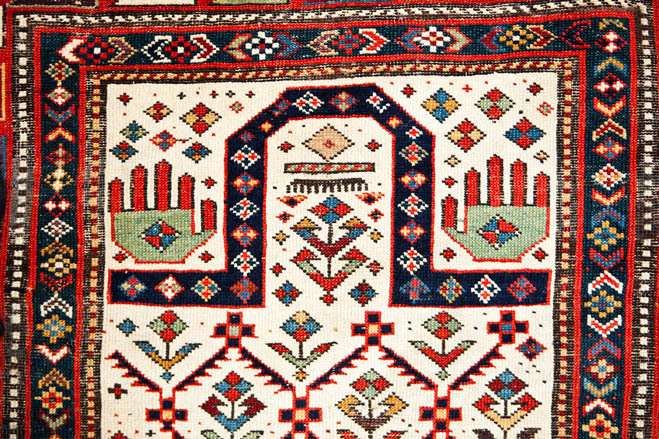 While extending and expanding on the traditional design motifs found in vintage antique Caucasian rugs, the Pakistani master weavers responsible for this rug strictly honored the Azeri rug making traditions. Vegetal dyes, handspun wool yarns, weave densities and characteristic finishing techniques all contribute to an authentic look and feel in this rug. 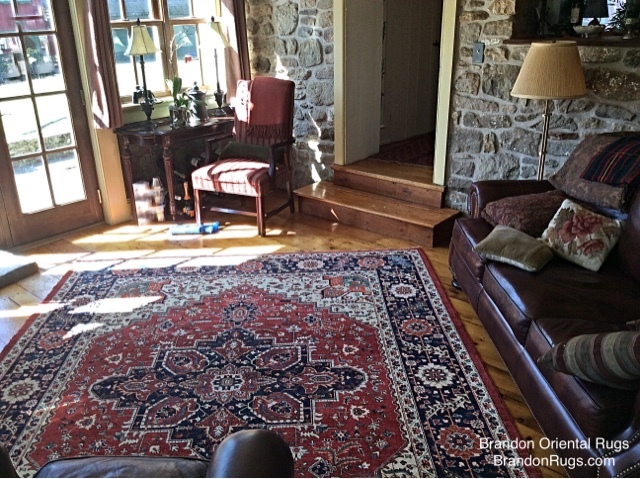 Customer's of Bucks County, PA rug-store Brandon Oriental Rugs - www.BrandonRugs.com - found this real handmade oriental rug for their historic Doylestown, PA farmhouse kitchen. 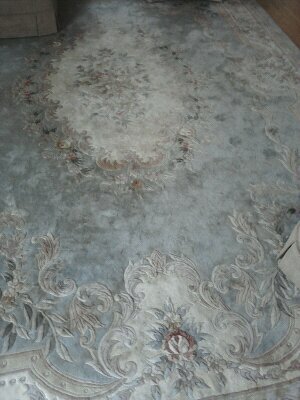 The room waited over one hundred fifty years to get the rug it deserves to protect and grace its floors. Brandon provided our customer with complimentary rug delivery to their home. Installation of the rug together with the proper rug padding was also included so they had nothing to do except enjoy the rug presentation and decide if their first impressions of the rug at Brandon's store were confirmed by its look and feel in its special place in their home. 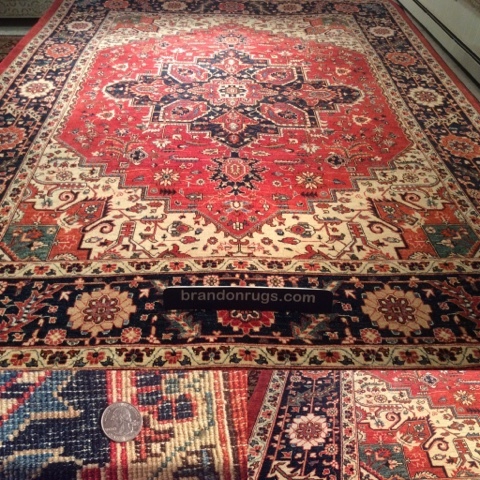 The rug chosen is an 8x10 reproduction Persian Ferrahan design made in India according to a 13/65 contract. It has over two hundred hand-tied knots per square inch. The small pattern and intricate detail of the rug (extremely practical in the eating area) does not in any way diminish the feeling of functional simplicity in the farmhouse kitchen; and is period and style appropriate with the age and character of the home. The owners of an historic farmhouse in Doylestown, PA recently completed repairs and building code upgrades on several rooms in their home. As part of the renovation they elected to place a real hand-knotted oriental rug in the original room of the mid-1800s homestead, the kitchen, to protect the newly refinished heart-of-pine floors. They chose Bucks County rug store Brandon Oriental Rugs - www.BrandonRugs.com - to assist them with finding a practical solution to their need: something to protect the floors; able to stand up to heavy traffic and daily use in the informal dining area of the home; and something that would look period appropriate without necessarily being a nineteenth century antique rug. 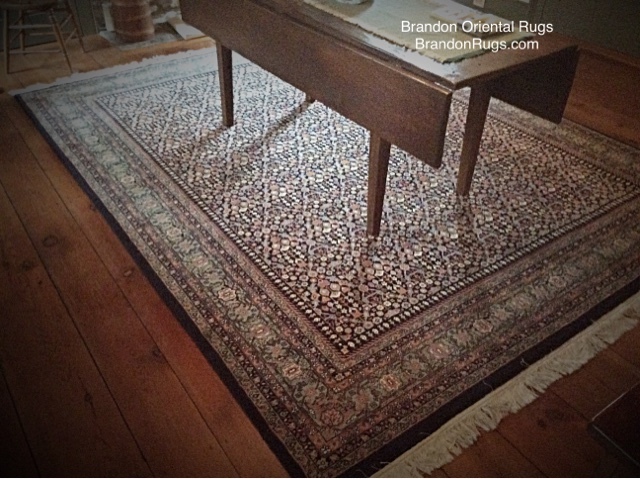 The rug Brandon helped the homeowners find is an India made reproduction of a Persian Ferrahan design. Made according to a 13/65 contract, it has over two hundred hand-tied knots per square inch; giving it beautiful detail, and enhanced wear characteristics that no machine-made or hand-tufted quality rugs can match. 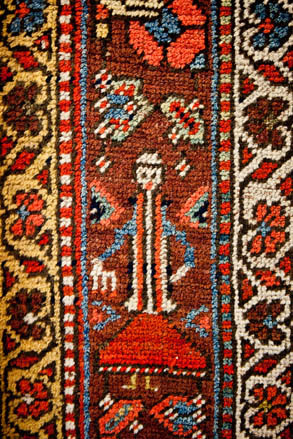 While not essential to the ability of the rug to resist stains - which is a natural, built-in characteristic of hand-knotted wool pile oriental rugs - the owners and Brandon focused their rug search on a highly detailed, dark background rug, able to mask any marring from the daily meals being served and eaten atop it. The rug chosen is a perfect fit that respects the history of the home; and is just perfect in achieving all that is expected of it for many years to come.